Zoe and I went to Ash Wednesday services tonight. It was a first for both of us, though each year I’ve had such good intentions of going. As we sat there, often in silence, I found myself fixating on the mark of the ash that would soon be on my forehead. The ashes’ indication of my mortality, my inherent need for a savior. The mark of the ash introduces us to the world as the mortals we’d rather forget we are. Tells our neighbor that, while we may seem just fine, we really are going to die. 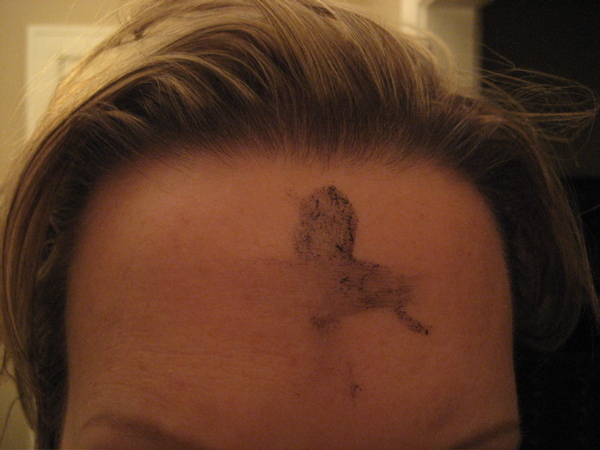 The mark of the ash seems to me to be strangely similar to the bald head of chemotherapy. When I was bald I wore my illness and my mortality on my head. A good wig, of course, made my bald head less noticeable, but when the eyebrows and eyelashes accompanied the hair already down the drain, it got tougher to camoflage. I was marked and there was no way to get around it. Now, with a newly highlighted coif, it’s easy to blend into the world of the well. Easier, too, for me to forget my own disease. This mark of the ash brought it back to me. Put it right back on my forehead for everyone to see. But this nice thing was, after the service was over, I saw it on the foreheads of everyone around me, too. We were all marked. We are all marked. It was as if we all stood there with chemo-bald heads looking at eachother a little warily. Beginning these forty days of Lent with a bit of a start, a jolt. Oh, right, we’re all going to die. All of us. And then we wait these forty days. Some of us depriving ourselves of a favorite indulgence. Some of us committed to doing something better. Some of us convinced that giving something up for Lent is only for Catholics. But all of us waiting. For that Easter. When we can look around at our marks of ash, at our bald heads, and know that death has been swallowed up in victory. That our ashy foreheads are clean for all eternity and our bald heads are covered with immortal hair. Perhaps I’ve never attended an Ash Wednesday service because I don’t do Ash Wednesday all that well. I keep fast forwarding to Easter.